Whether you witness a tall ship breaking over the horizon or see one up close at a festival, there’s nothing quite like being in the presence of a full-fledged sailing ship. These majestic vessels are often thought of as ocean-going vessels, but many tall ships ply the waters of the Great Lakes. Some have homeports on the Great Lakes, whereas others are based abroad and only visit the region occasionally. Kaitlin Morrison, author of Tall Ships: History Comes to Life on the Great Lakes, shares with us the sea story of the Friends Good Will. Friends Good Will is a replica of the famous warship of the same name that served in the War of 1812. The original ship was constructed in 1810 and participated in the Battle of Lake Erie. She was built as a merchant ship and was transporting fresh supplies to Fort Dearborn when she was captured by the British. She was renamed Little Belt and armed for warfare. 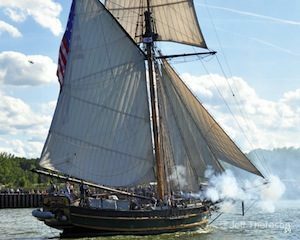 During the famous battle of October 1813, she was captured by Oliver Hazard Perry and again served the United States, transporting American soldiers across Lake Erie, supporting the unsuccessful American invasion of Southern Ontario. Unfortunately, the Friends Good Will was beached in a storm in 1813, and the British set her ablaze at the beginning of 1814. In honor of the original ship, a replica of the Friends Good Will was constructed in 2004. 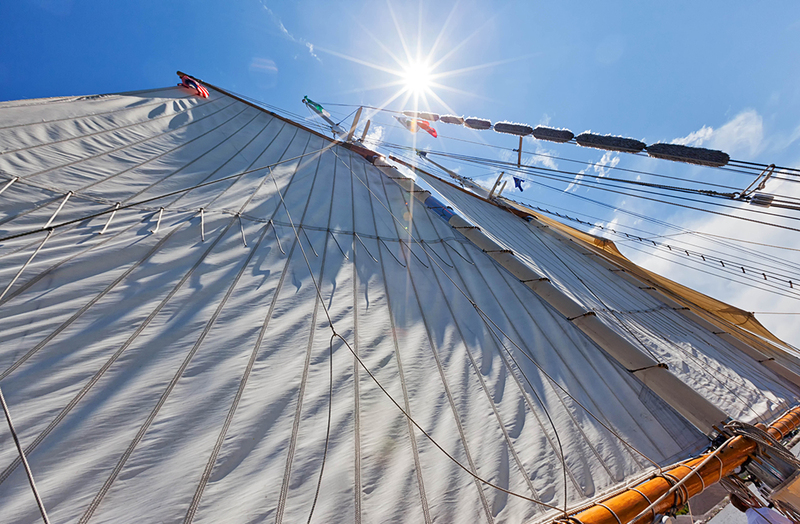 Operated by the Michigan Maritime Museum, the new ship sails as a memorial to the proud original, and it offers a wide variety of sailing excursions, from daysails and sunset sails to kid-friendly “pirate chaser” excursions. On occasion, the crew even dresses in period costumes. If you’re interested in a more private outing, the ship can also be chartered for events and weddings. Construction of the Ship The Friends Good Will replica is not an exact copy of the original ship. Traditional construction methods were not used when producing the vessel; utilizing modern methods helps the ship accommodate passengers and remain easier to maintain. Nevertheless, the ship was crafted to closely resemble a traditionally built vessel. Wood laminate construction was chosen, allowing portions of the ship to be built from multiple pieces of wood, instead of requiring each piece to be carved from a single tree. All rigging and sails are created from modern materials, but they are designed to appear authentic to the nineteenth century.